I hereby declare I have decided from this moment forth to only eat artisanal food handmade within a 3 block radius of my house. This doesn't worry me one jot. I can have Fatted Calf cold cuts for starters and Michael Recchuiti's Smores for dessert. Every Day. Sorted. Perfect for those moments when the camp site has put a ban on open fires, these Smores come ready-assembled. And if your pinny is too pretty to be splattered in melted chocolate these ready-made smores will come in handy in the home kitchen too. A gooey blob of marshmallow is perched on a super-crispy tile of graham cracker before both are enrobed in rich bittersweet chocolate. I love the contrasts it delivers. 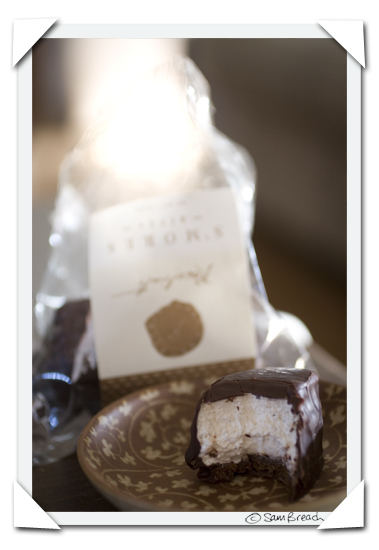 Texture-wise the crunch of the biscuit is softened by the puffy marshmallow and the velvety chocolate. Colour-wise the dark, dark chocolate highlights the white, white within. Taste-wise the overall sweetness is balanced with the tinge of bitter. It's too big to pop into your mouth in one bite, but don't complain about that, it just means the pleasure lasts longer. PS - Remember. Food isn't magic. When you are really sad nothing you eat will cheer you up, not even the sweetest of Smores. Save the Smore's for regular or happy occasions. They will taste better that way. Funnily enough smores have cropped up in a few blogs I've been reading...still don't really know what they are! Do I take it you like them sam!!! This would have been the perfect post for our fun monday topic a couple of weeks ago! Sweetnapa (http://sweetnapa.com) sent me something similar not too long ago that was amazing. You know, this is unrelated to s'mores (although those look delicious -- but can cold s'mores really ever rival them fresh-made and hot? Seems like scones, to me), but I just had this epiphany: I found your blog through a friend who pointed me your way, and if memory serves correctly, she knew you through ILM, maybe? But then I just realized, I think I had dinner once at my friend Mary Beth's with someone named Sam who was British and maintained a food blog and I now kind of suspect that was you. I was sitting on a pillow I may never have gotten back, at the very end of the table, with my friend Robin, and you (if indeed it was you) were a seat or two away, facing the window. Note to Self: Tattoo that p.s. wisdom on the inside of my eyelids. Yep, I've been cooking out of Heidi's new book lately, too, and having success. Nice thing about Austin, lower cost of living, affordable houses -- I have a luxurious kitchen now, so my cooking is thriving in a way it never did in my small, poorly lit SF apartment kitchen. Of course, the quality of ingredients is lower here (and they're more expensive too, thanks to all the shipping), so it's tradeoffs. I'm gonna be back in SF sometime soon I think, though, to visit. Wild about being at EARS now! What a small world. Bizarre. I have decided only to consume food purchased or caught within one block of my home in the exclusive area of San Francisco's Rincon Hill/South Park district formerly known as "Skid Row". At the corner convenience store/vice pit I will dine on the finest cans of imported Vienna sausage and oven baked, vegetarian Funyuns. Gently wash that down with a vintage bottle of Cisco, or perhaps a macro-brewed malted alcoholic beverage (available in 40-ounce bottles! ), I will then purchase one fruitless dream (lotto ticket), one vial of ginseng extract to recycle later as a crack smoking apparatus, and one Summer Edition copy of "Bodacious Ta-tas" printed with soy ink on 20% recycled paper. Wild game choices are many - but mostly consists of free-range City Chicken (aka pigeon) and City Rabbit (wharf rat). I will then look ghhhetto fabulous in my thrift store, two buck, red "Who invited all these tacky people?" apron made with the finest synthetic materials. Thanks for the inspiration, Sam! Sam, I just discovered your blog (from Michael Ruhlman's blog) and I have to commend your photography. You have a true talent. Smores make my belly ache, but I'd eat that thing anyway. That's how good your photography is. I'd like to see you stick to the 3-block radius challenge! Ah, you've brought me back to my camping days with this post...Since these are a bit far from me, bonfire anyone? Did Fred tell you the French name of these s'mores? It's very politically incorrect. I think I could eat s'mores on ALL occasions! I wonder...can I impale them on a stick and toast them over the burner? hmm...that looks good. do they come with caramel in them too! Its so true what you say about Smores/food in general not being able to cheer you up when you're really sad. I'm pretty sad today and wanted to eat some comfort food, but instead spent 45 minutes in the grocery store cause I just couldn't find anything to 'fill the void'. Heres to save food like this for a happy day. I should know better. I've been craving chocolate all day and have been trying not to think of the Dabon Bar on the kitchen counter (don't think of it . . . don't think of it). But then I pop onto your blog and am totally undone. Chocolate . . . here I come! OMG. If I tried doing that, I'd starve. I didn't know what one was either, and I am not sure if I could find one here in the south of France, however your blog is inspiring. Hi everyone - these are not s'mores for the fire since the chocolate has already melted- these are smores for fireless people - if you have a fire then you a can make the real thing! Also Michael Recchuiti sells a smore kit which might be better for campers? Wasn't Luna Park the first place to have the little do-it-yourself S'mores cooker on the table? The cold ones you're in love with remind me of v. upscale Malomars -- ask Seinfeld or anyone from New York. That chocolate/marshmallow combo can't be beat. I love sundayes with vanilla ice cream, hot fudge sauce and marshmallow spread.